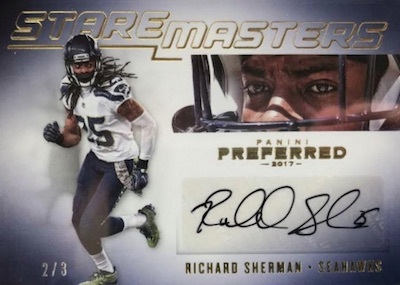 A popular option for NFL collectors with a little more to spend, 2017 Panini Preferred Football only packs the hits. In each hobby box waits four autographs and one memorabilia booklet card. Building on the 2016 set, Preferred features a strong selection of hard-signed autographs and oversized relics, including several new choices. 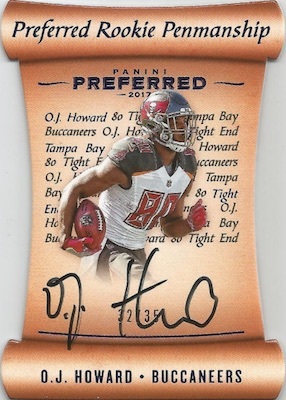 Without a standard base set to center around, the 2017 Panini Preferred Football checklist relies on the many signed cards. 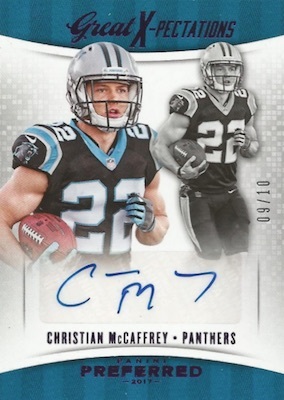 Arguably one of the top autograph lines Panini has, Silhouettes uses on-card signatures and jumbo jersey swatches. Collectors can expect one of these per box. 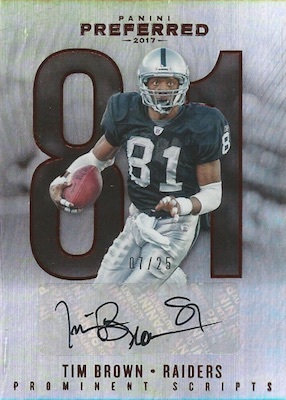 The limited parallels include Prime, Super Prime and NFL Shield (#/5 or less). Great X-Pectations is carried over from 2016 with a fresh design for 40 rookies. On the other hand, Preferred Penmanship is a new die-cut set that utilizes a scroll-like design, and adds on-card signatures, as well. 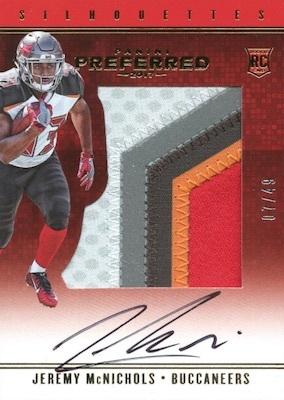 Putting the excitement back in relics, 2017 Panini Preferred Football has one memorabilia card per box, but these aren't run-of-the-mill options. All done as book cards, the lineup includes the six-piece Armory booklet with a vertical orientation for rookie players. Game of Inches goes jumbo with dual oversized swatches, and Championship Fabric concentrates on the Super Bowl winners. There is also the Red Zone book insert. 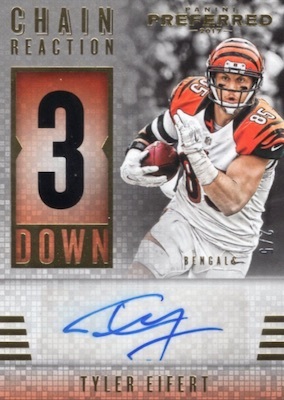 See the current 2017 Preferred NFL autographs on eBay. 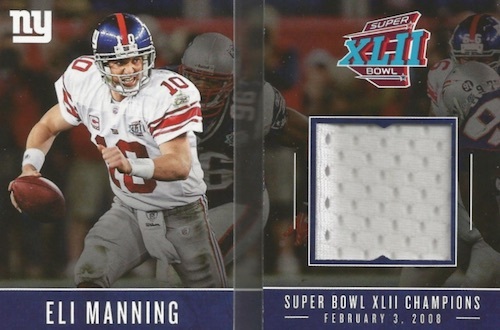 PARALLEL CARDS: Prime #/25 or less, Super Prime #/5 or less, NFL Shield 1/1, Printing Plates 1/1. PARALLEL CARDS: Prime #/49 or #/25, Super Prime #/5, NFL Shield 1/1, Printing Plates 1/1. PARALLEL CARDS: Purple #/25 or less, Gold #/10 or less, Green #/5 or less, Platinum 1/1, Printing Plates 1/1. PARALLEL CARDS: Blue #/35 or less, Purple #/25 or less, Gold #/10 or less, Green #/5 or less, Platinum 1/1, Printing Plates 1/1. All subjects not included in Blue/Purple/Gold parallels. View specific options with the spreadsheet. PARALLEL CARDS: Blue #/99 (Shaheen #/49; No Jabrill Peppers*), Purple #/25, Gold #/10, Green #/5, Platinum 1/1, Printing Plates 1/1. 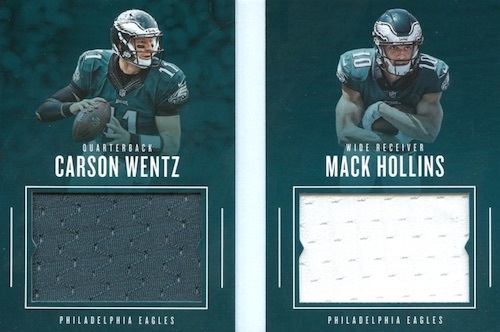 PARALLEL CARDS: Second Down #/25 or less, Third Down #/10 or less (No Ricky Williams*), Fourth Down 1/1, Printing Plates 1/1. PARALLEL CARDS: Purple #/25 or less, Gold #/10 or less, Platinum 1/1, Printing Plates 1/1. PARALLEL CARDS: Purple #/5 (Charles Haley, DeSean Jackson - #/10; Brett Favre - #/3*), Gold #/5 or less, Platinum 1/1, Printing Plates 1/1 (No Barry Sanders, Eli Manning*). PARALLEL CARDS: Purple #/25 or less (No Ted Hendricks*), Gold #/10 or less, Platinum 1/1, Printing Plates 1/1. PARALLEL CARDS: Prime #/25 (Lewis - #/10; Brady, Rodgers - #/5*), Super Prime 1/1. PARALLEL CARDS: Prime #/25 (Kamara/Brees - #/5*), Super Prime 1/1.